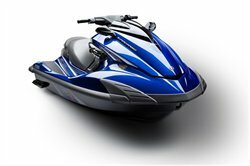 The Powerplant - The FZR is powered by a 1.8 liter, supercharged, super high output Yamaha Marine Engine. This 1812cc engine, which is purpose-built for the marine environment, is the largest displacement engine ever installed in a personal watercraft. It is also the only engine in the high-performance, four-stroke category optimized to run on the least expensive Regular Unleaded fuel. The Powerplant - Electronic Fuel Injection (EFI): Four electronically controlled fuel injectors, throttle position sensor (TPS) and intake air pressure and air temperature sensors supply the optimum air/fuel mixture. The results are a smooth, high power output with low fuel consumption and low exhaust emissions.The Powerplant - Specially Designed, One-piece Cylinder and Crankcase Assembly: Provides tremendous engine rigidity that's lighter and stiffer than two-piece designs. The Power plant - Slant Detection Switch: Electronic switch stops engine and oil pumps immediately if watercraft becomes overturned, protecting motor from unwanted water ingestion. The Powerplant - High Volume Intake Box: With water repellent air filter and flame arrestors. The Powerplant - Wet Sump Lubrication: Uses two engine oil pumps to deliver lubricated oil to each moving part with water-jacketed sump and oil backflow protection. The Powerplant - Independent Water-jacketed Exhaust Manifolds with Collector: Achieves high power while keeping noise and exhaust heat under control. The Powerplant - Thermostatic Cooling System: Water flow through the engine is automatically controlled through a thermostat sensor. The Powerplant - Corrosion Protection System: Sacrificial zinc anodes protect the engine from harmful galvanic corrosion. Stainless steel fasteners (nuts, bolts, hardware) provide a long service life. Cylinders, cases and heads are all treated with a durable oxide coating to form a barrier between corrosion and expensive engine parts. The Powerplant - Electronically Controlled, Variable Ignition Timing: For exact ignition advance control at all throttle positions and RPMs. The Powerplant - Direct Ignition: For more efficient combustion. The Jet Pump Propulsion System - The FZR's 155mm hyper-flow jet pump propulsion system with three-blade stainless steel impeller is designed to maximize water flow for high performance. The FZR pump configuration provides excellent hook-up and smooth acceleration. The Jet Pump Propulsion System - The industrys only Reverse with Traction Control technology: Maintains the perfect RPM to provide the optimal speed for effectively maneuvering when the watercraft is in reverse. The Jet Pump Propulsion System - Quick Shift Trim System (Q.S.T.S. ): Mechanically operated, this system offers instant change in the attitude of the watercraft while underway allowing for tighter turns or quicker acceleration on plane, as the rider prefers. Q.S.T.S. offers 24 degrees of total trim range. The Jet Pump Propulsion System - Stainless Steel Impeller Housing Liner: For high durability, the liner maintains accurate clearance tolerances between the impeller and the housing. The Jet Pump Propulsion System - High Flow Intake Duct and Grate: The dynamic shape of these items directs water flow into the pump for better thrust, performance and hook up. The Jet Pump Propulsion System - Pumps are Manufactured with YDC30: A combination of zinc and copper alloys, developed by Yamaha marine engineers, that offers excellent corrosion protection. The NanoXcel Hull and Deck - The FZR features the worlds first hulls and decks manufactured through the use of cutting edge nanotechnology. Yamahas NanoXcel ultra-lightweight, high strength material reduces the weight of the hull, deck and liner by 25% and provides performance gains in acceleration, top speed and performance-driven handling. Additionally, the NanoXcel material offers a shinier, gem-like finish which reduces surface tension on the water, providing a more nimble, responsive ride. The NanoXcel Hull and Deck - All New Performance-Enhanced Hull: Provides excellent agility and maneuverability. The NanoXcel Hull and Deck - Sponson Design: Provides added straight-line comfort and an improved two and three-up riding experience. Telescopic Steering: Three variable positions designed to give the driver the option of standup riding, traditional sit-down riding or low to get even closer to the action. Racing-Inspired Fastback Seat: Accommodates up to two people for a performance-driven ride. Dual Analog Meters: Provides the operator a quick read on speed, RPM, fuel level, low fuel warning, low oil pressure warning, battery voltage, overheat warning, hour meter, check engine light with self-diagnostic function and the industry's only audible warning system. Industry's First Remote Controlled Transmitter: With the touch of a button on Yamahas innovative remote controlled transmitter, you can activate and deactivate the FX SHOs digital security system and all-new Low RPM Mode from up to 30 feet away. 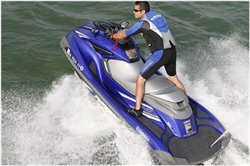 Low RPM Mode The personal watercraft industrys first fuel saving feature, Low RPM can reduce fuel consumption by up to 26% based on average annual use. Yamaha Security System: This security system that can be activated with the touch of a button ensures that no one starts the FX SHO without your permission. 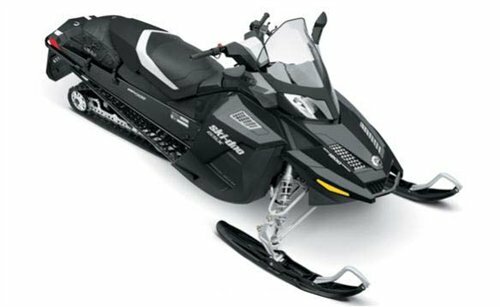 21.3 Gallons of Total Storage: Includes a large, watertight storage compartment under the seat and the glove box. Glove Box with Self-draining Beverage Holders: The industry's first self-draining beverage holders. Dual Mirrors: Automotive style and convenience. Finger Throttle Lever: Provides added comfort while reducing hand fatigue. Yamaha's Trademarked Visibility Spout: A waterspout from the rear of the craft that improves the watercrafts conspicuity.